Tsunami Krakatoa is the most popular video on Steven Ward's YouTube channel, Ingomar 200. The Bento Rodrigues Mine Disaster, posted February 11, is the most recent addition to the channel. In November 2015, at least 17 people died in Brazil's worst mining disaster when two dams collapsed and sent contaminated water from an iron ore operation flooding into the small town of Bento Rodrigues. You can get a good idea of the magnitude of the disaster from a video posted recently by geophysicist Steven Ward on his YouTube channel. While you're there, you can browse through dozens of videos showing the geophysics of volcanoes, landslides, floods, tsunamis, and other natural and manmade disasters. The videos look like animations, but they are actually the product of physics-based computer simulations of the forces driving these events (mainly gravity, friction, and buoyancy). Through his YouTube channel, which now has more than 2 million views, Ward is reaching a steadily growing audience. "I view it as a public service project," he said. "I'd like to think that maybe 20 of those viewers were inspired to a career in science." 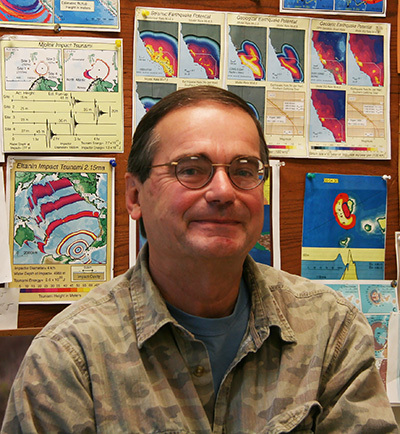 For much of his career as a research geophysicist at UC Santa Cruz, Ward has been using computer simulations to study the dynamic processes that shape the Earth. About ten years ago, improvements in video editing software made it a lot easier for him to turn those simulations into short, educational movies. "For decades I was publishing papers and doing the traditional things that academic scientists do, and then I just decided that I wanted to take the science directly to the people," Ward said. "I get instant feedback, viewers learn from them, and I have fun doing it." Based on the feedback he gets, Ward knows that the videos are often used in schools, museums, and other educational settings, but it's hard to say what draws most of the viewers. Even the older videos continue to rack up viewer numbers. "My videos have a long shelf life," Ward said. He launched the YouTube channel in 2010 and has now posted nearly 70 videos. The most popular one, with more than 300,000 views, is "Tsunami Krakatoa," which shows what happened in the ocean after the explosive eruption of Krakatoa in 1883. Many of the videos recreate historic events, including the 1889 Johnstown Flood in Pennsylvania and the 1928 St. Francis Dam disaster in Los Angeles. Others represent possible future scenarios, such as a major eruption of Mt. Vesuvius in Italy ("Mt. Vesuvius: Pyroclastic Flow & Tsunami"), or the second most popular video on the site, "La Palma Mega Tsunami," which shows the consequences if the flank of a volcano in the Canary Islands were to collapse into the ocean. While the physics behind the videos is highly sophisticated, the videos themselves are not slick productions. Ward emphasizes that "simulation is not animation." The movies lack a soundtrack--no voiceovers or music--just the simulations intercut with maps, photos, and short explanations that are easy to read on screen. Ward said many of his viewers may not speak English, noting that Italy and Indonesia rank second and third for viewer numbers behind the United States. "I try to keep them short and tell an interesting story," Ward said. "It's important to keep it simple but not dilute the science."